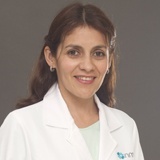 Dr. Paulina Manosalvas Martinez obtained her Medical Degree in Medicine and Surgery from the Catholic University of Santiago de Guayaquil, Ecuador, in 1995, being awarded as one of the best graduates. She later became Specialist in Obstetrics and Gynaecology from the Complutense University of Madrid, Spain, after 4 years of training in the 12 de Octubre University Hospital of Madrid, Spain. During this period she also received Advanced Studies Diploma as a part of her PhD in Obstetrics and Gynaecology studies from the Complutense University of Madrid. Dr. Paulina has more than 10 years of experience in the field of Obstetrics and Gynaecology. She started her professional career as an Obstetrician and Gynaecologist trainee at the 12 de Octubre University Hospital of Madrid, one of the most prestigious hospitals in Spain with around 1,000 beds and all sub-specialties covered, which let Dr. Manosalvas to acquire great experience in managing all the pathologies related to her specialty. After finishing her training in 2009, she stayed being part of the medical staff in the same hospital and became a Member of the Breast Cancer Unit. During this time she took part in several trials conducted by the hospital, and actively participated in all teaching issues related to the training courses that the Breast Cancer Unit offers every 6 months. She obtained Level 3 Ultrasound of Spanish Society of Gynecology and Obstetrics (SEGO). She also supported her Department as Instructor in practical teaching for the Medical School of the Complutense University of Madrid. She has attended many courses and conferences, both national and international. Dr. Paulina has contributed too many publications. She has had abstracts in medical congresses to her credit. Dr. Paulina is fluent in Spanish and English.